In this e-juice review, we’ll be covering the entire line from Double Comma Vapes! Their e-liquid line consists of 6 unique flavors, and they’re offered in 30ml unicorn bottles or 60ml glass bottles. The nicotine strengths available are 0mg, 3mg and 6mg. In addition, all of their flavors have an 80VG/20PG blend, which is perfect for both drippers and sub ohm tanks! Double Comma Vapes did win an Iron Reward for best cereal last year and their coffee has been called best in the industry! Not to mention, their e-juice is made in an ISO 5 lab, ensuring clean and quality e-liquid. When they started the brand, their main focus was on quality and creating an amazing line of flavors! They do run deals on their quite often, so be sure to check their website and Vaping Cheap for deals! 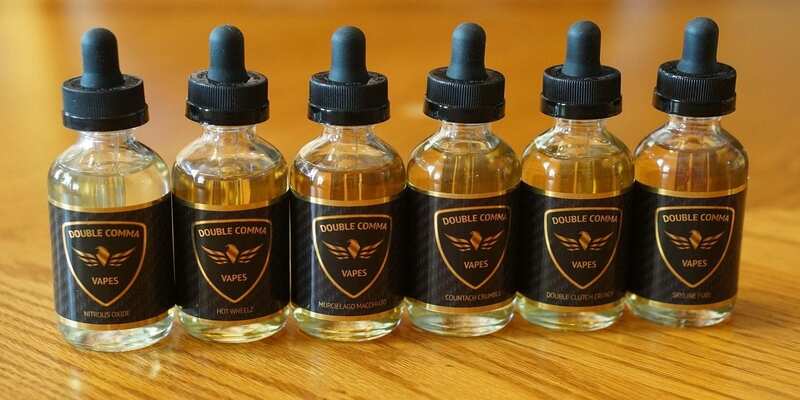 Before getting any further into this e-juice review, we’d like to thank Double Comma Vapes for sending these 6 flavors for the purposes of this review. We will provide you with our overall thoughts about these flavors and let you know whether or not we recommend them! Remember, taste is subjective, so what we may like you may dislike and what you like we may dislike. We will first go over the specific mods and atomizers used to test each of these flavors and then will continue on to the review of Double Comma Vapes E-Juice! Flavor Description: Remember watching cartoons eating a bowl of cereal? Yea, we do too. We wanted to bring you right back to the good ‘ol days and have created the best cereal vape juice where on the inhale you’ll taste delicious bananas, peanut butter and milk and on the exhale, you’ll get that buttery crunch cereal goodness! It will be your favorite!! This is Double Comma Vapes’ Award Winning Vape Juice, and they won the Iron Award at Vape Nights at Las Vegas, so naturally this is the first that we wanted to try. With that being said, we can easily see why this e-juice won an award. This is definitely one of the best cereal vapes we’ve tried, and much different than any other cereal flavor in our opinion. This is certainly not your typical cereal vape, and we’re happy Double Comma Vapes went a different direction with this one as it surely paid off. On the inhale, you are met with a creamy banana peanut butter flavor, with the banana being the most dominant. However, on the exhale you taste the crunch cereal with hints of banana and a peanut butter note right on the tail end. Both the inhale and exhale is creamy, which makes this e-juice even better in our opinion. In addition, the banana flavor is natural tasting. All of the flavors in this e-juice are blended incredibly well together, and you can taste every flavor in the description. The throat hit is silky smooth, and the vapor production is solid. All in all, Double Clutch Crunch by Double Comma Vapes is an all day vape for us at Vaping Cheap. It’s a masterpiece of an e-juice, and any cereal lover will absolutely enjoy the vape experience this flavor provides. This is an interesting peanut butter and grape jelly flavor and quite different in comparison to the e-juices we’ve tried with a similar flavor profile. On the inhale, you get a grape jelly flavor with a hint of peanut butter. You get the same on the exhale as well, but the grape jelly is slightly on the candy side, and is what makes this vape interesting and different. On the end of the exhale, you get a smooth and creamy peanut butter flavor, which gives it a nice finish. You don’t really taste any “bread” flavor in this e-juice, which is not a good or bad thing in our opinion, it simply depends on what you’re looking for in this specific flavor profile. For us, this flavor is quite enjoyable just as is, and the slightly candy grape jelly flavor really makes this e-juice unique. This flavor is pretty straightforward and you taste pretty much everything that’s mentioned in the flavor description, which is great! The throat hit is smooth and the vapor production is excellent. All in all, Double Comma Vapes Hot Wheelz is a solid peanut butter and jelly vape, and can easily be vaped all day. If you like this type of flavor profile, but prefer more jelly than peanut butter, you’d certainly enjoy this one. Flavor Description: Oh the Classic Countach – as close to heaven as you can get! We think that the “Countach Crumble” Peach Vape Juice is a close second! It’s a dessert vape juice so good it deserves its own poster in your garage. The combination of fresh ripe peaches followed by the buttery sweet crumble topping with a dash of cinnamon is worth dreaming about, much like the Countach! This is a very good peach dessert flavor, and vapes great at higher wattages or hotter builds. On the inhale, you get fresh ripe peaches that is natural tasting. On the exhale, you get the same fresh ripe peach, but it’s followed by a buttery crumble (bakery note) and a faint hint of cinnamon at the tail end. The exhale has a creaminess to it, which certainly adds to the entire vape experience. The peach is the most dominant flavor throughout both the inhale and exhale, so if you like peach vapes, you’ll love this flavor. To us, it tastes exactly like if you just bit into a peach crumble that’s sprinkled with cinnamon. The cinnamon flavor is quite light and is only noticeable towards the end of the exhale, which is not a bad thing. Some cinnamon flavors are overwhelming, so we were glad to see this one was just a hint of it. The throat hit is very smooth and the vapor production is top notch. Overall, Countach Crumble is an excellent dessert vape, and is yet again considered an all day vape. We do think vapers who enjoy peach dessert flavors will certainly enjoy this one as it’s well blended, and just vapes great in both tanks and drippers. So if you’re that vaper, definitely give this one a try! Flavor Description: Once you hit the fire button on this Energy Drink Vape Juice you won’t be able to stop. No danger to manifold pressure, jitters or caffeine crashes with this E Juice. Just the delicious Lemon Energy Drink flavor you will want to hit over and over. Lemon vapes are sometimes a hit or miss since it’s a flavor note that can sometimes come off tasting as “lemon pledge”, well this is certainly not the case with Nitrous Oxide. However, we do want to say right away that this flavor does have a bit of Koolada in it, so if you dislike that “cooling” effect this provides, then you might not like this one. With that being said, we’ve never really tried a energy drink flavor, and when smelling this e-liquid, it smells spot on to a lemon energy drink. On both the exhale and inhale, you’re met with an lemon energy drink flavor. The primary flavor note is lemon, but there’s other flavor notes in there that brings you the “energy drink” flavor note. It is blended quite well, and pretty much tastes exactly like it says in the flavor description, lemon energy drink on ice. The koolada is a very noticeable, and as soon as you exhale you’re greeted by it. This is not menthol, so it doesn’t have that menthol taste, but has a cooling effect. This tastes exactly like if you took a sip of a lemon energy drink that’s been sitting in a cup of ice. All in all, this is a solid beverage flavor, and very unique. The lemon flavor is not overwhelming, and the throat hit is silky smooth. The vapor production is also very good as well, and it is to be expected with an 80VG/20PG blend. If you’re a fan of lemon flavors and koolada, then Nitrous Oxide by Double Comma Vapes is a definite must try! Flavor Description: Finding an amazing Grape Vape Juice is about as easy as spotting a unicorn in the wild. Well lucky for you, we’ve captured the amazing taste of your favorite childhood grape sugary drink in our Skyline Fuel E Juice. Try it today and we’re sure you’ll think it’s the Best Grape Vape Juice of 2017! This is yet again another solid e-juice crafted by Double Comma Vapes, and pretty spot on to the flavor description. On the inhale, you get a grape fruit drink. On the exhale, you get the same grape fruit drink, but it’s followed by hints of berries on the tail end. There might be a small amount of Koolada in this e-liquid, but it’s not as nearly as noticeable as the previous flavor reviewed. Skyline Fuel is a bit on the sweeter side, but not too sweet by any means. It’s just sweet enough to satisfy your sweet tooth! The grape flavor is natural tasting, which is great for this type of flavor profile. In addition, the throat hit is smooth and the vapor production is excellent. The fruit flavors mentioned in the tail end exhale mostly taste like if you just threw a bunch of different berries in your mouth at the same time. All in all, Skyline Fuel is an excellent fruit flavored e-liquid which matches its flavor description. 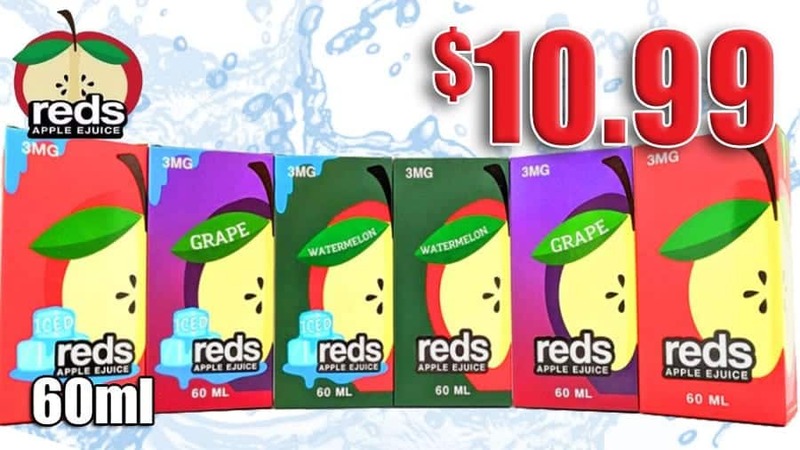 This is definitely one of the best grape fruit flavors we’ve tried, and this is a great choice of e-liquid for the Summer time. If you’re a fan of grape flavored e-liquids, then this is one we highly recommend giving a shot! Flavor Description: As summer is here, who doesn’t stop by their favorite coffee shop and get an iced coffee to get rev’d up? It’s a perfect drink for those long, mountain drives on a hot summer day! We’ve created an Iced Caramel Macchiato with a sweet vanilla syrup, espresso and a splash of caramel that is sure to be your summer vape of choice! We can easily see why some vapers call this e-juice the best coffee flavor in the industry, as this is certainly one of the best in our opinion. This is a very smooth dark coffee flavor, and blended quite well. On the inhale, you get a dark coffee flavor with faint hints of vanilla. On the exhale, you get the same dark coffee flavor, but the vanilla is more present and you can taste it mixed with the coffee as soon as you exhale. The caramel flavor comes in right at the end of the exhale, giving it a wonderful finish. The throat hit on this e-liquid is very smooth and the vapor production is just as you would expect with an 80VG/20PG blend. This is a well crafted coffee blend and you can pretty much taste every flavor note mentioned in the flavor description. While this is an e-juice we cannot vape all day, we can certainly vape this flavor every morning. Overall, this is another excellent and well crafted e-juice by Double Comma Vapes. If you’re looking for a solid coffee flavored e-liquid to try, then we definitely recommend checking out Murcielago Macchiato! In conclusion, Double Comma Vapes offer premium quality e-liquid at an affordable price. Each flavor reviewed is well crafted, and simply vape great. In addition, each e-juice in this line is unique in its own way, and provide just a fantastic vape experience. The throat hit from all of these flavors were silky smooth, so we can definitely say they’re using good quality nicotine. Our favorites from the line were Double Clutch Crunch, Countach Crumble and Hot Wheelz. The one that was our absolute favorite was award winning Double Clutch Crunch, this is just a fantastic and unique cereal vape. If you’re into cereal vapes and looking for one that’s much different than the rest, do yourself a favor and give this one a shot, you won’t be disappointed! The other flavors were great as well, but this one specifically is what stood out to us the most. All in all, if you’re looking for a new e-juice company to try that offers premium quality e-liquid at great price, then we highly recommend checking out Double Comma Vapes!